Pharaby, all 16 inches of her, is finally dressed. And contrary to my original intentions, this may be her only outfit! No Pharaby, it’s not you, it’s me. 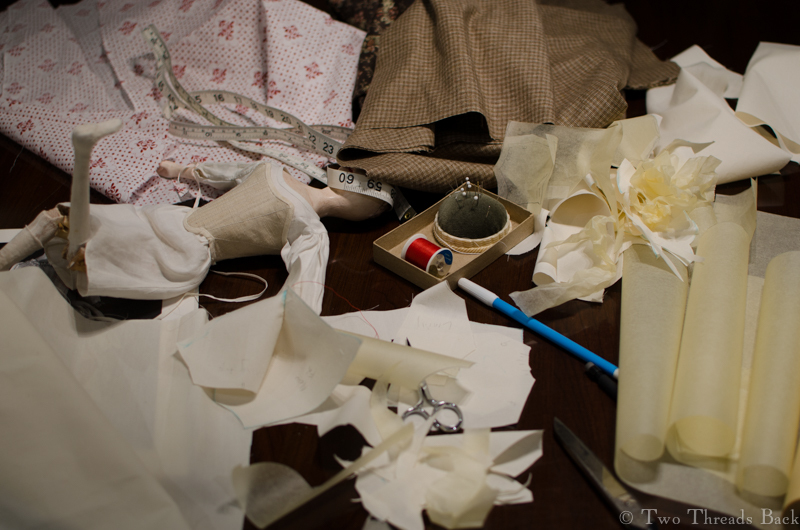 Since I haven’t posted our progress on the gown and final accessories, I decided to say it with (mostly) pictures. 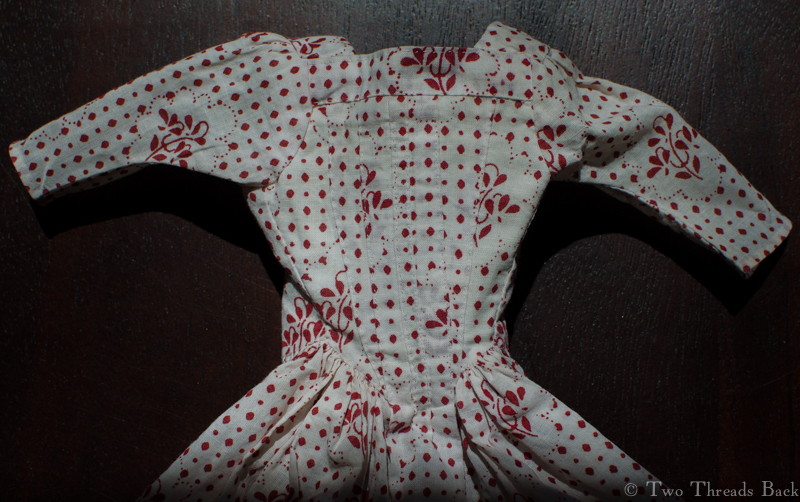 For the gown, I’d purchased a red and white cotton that proved not to be colorfast. Guess who has a cute little pink spotted ironing board cover now? 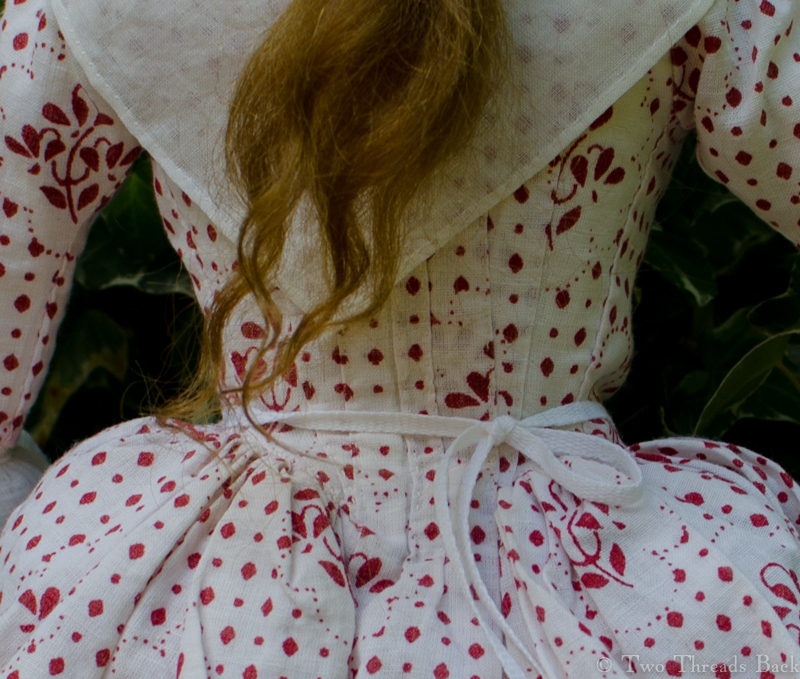 However, I’m so in love with the fabric that I’d choose it again. 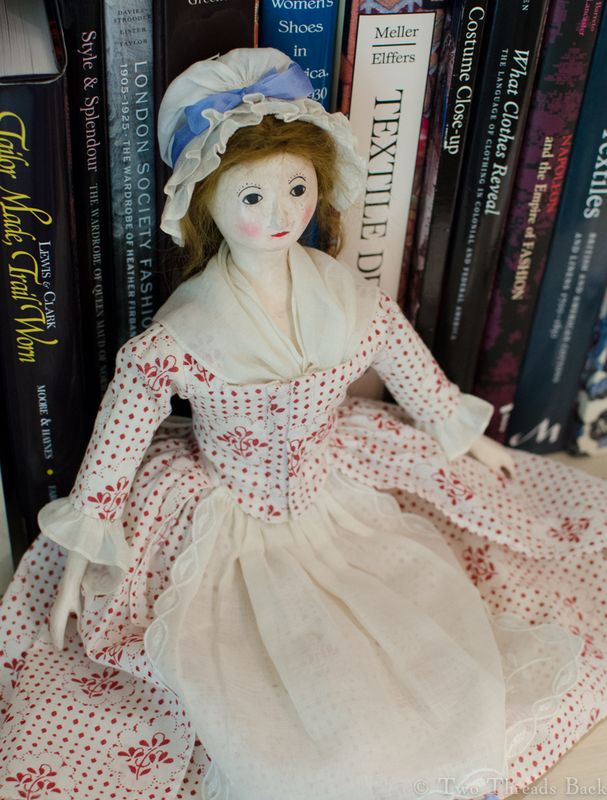 It reminds me of the dress on the Dudmaston doll, seen here. 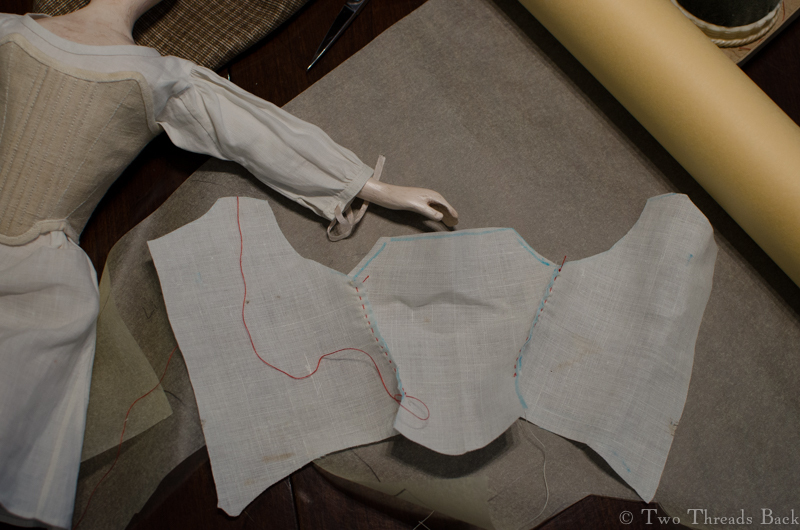 We started with the usual nightmare of pattern-making misery, as I tried to draw a bodice that would fit her form. 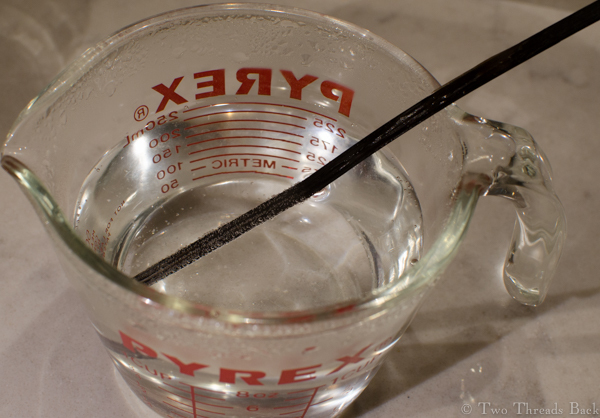 Yes, I know some people can do this in 3 minutes or less. 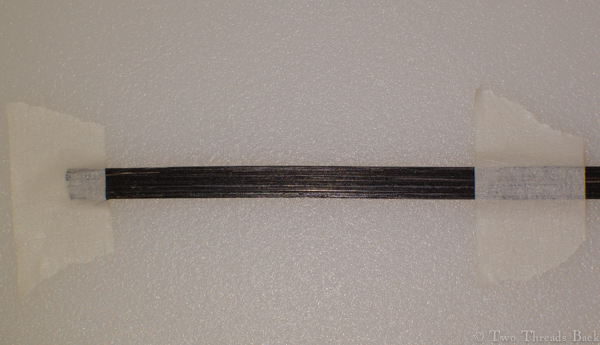 It looks so simple once it’s cut. It wasn’t. 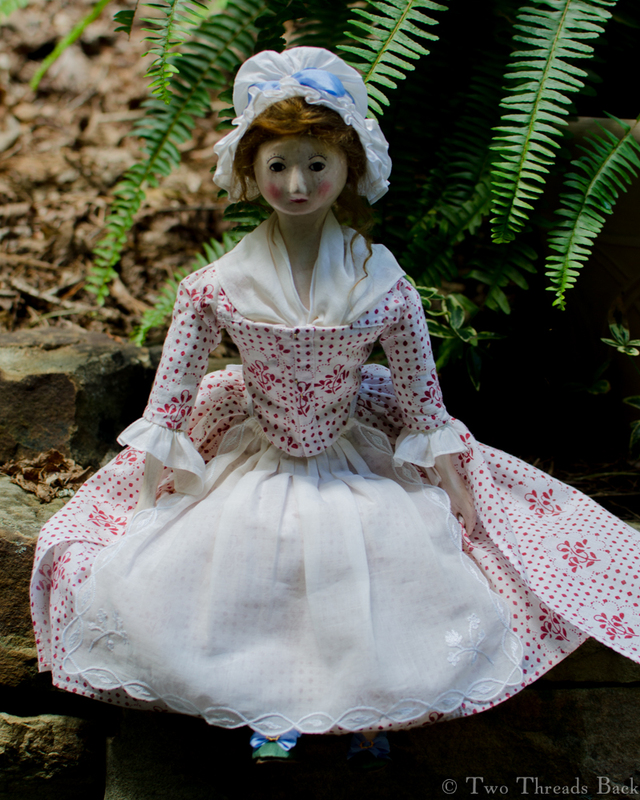 You wouldn’t know that I took a dressmaking workshop at Colonial Williamsburg a lifetime ago. I was too dazzled for much to stick. 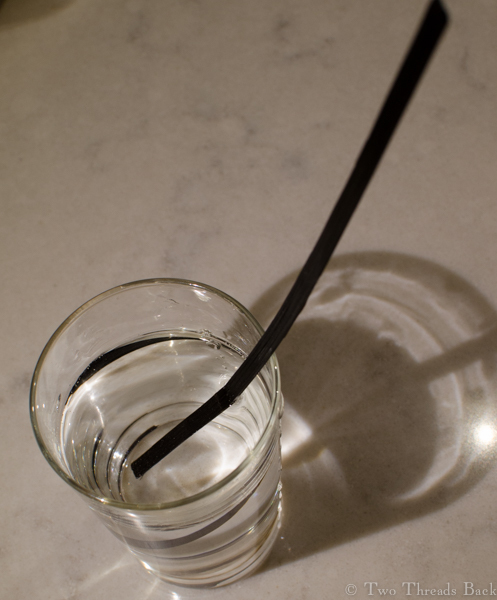 The nicest memory I have of it is their relaxed attitude toward mistakes. “Yaroo!” as Flavia de Luce would say! 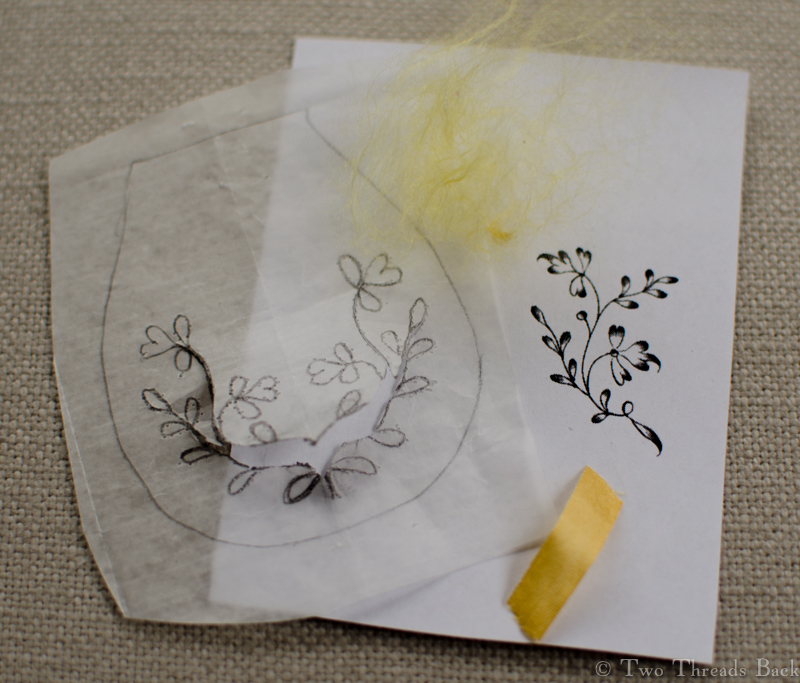 When it started to look like a teensy little gown I began to get excited – motivation to see it through! Do you know what the “F” and “B” stand for? 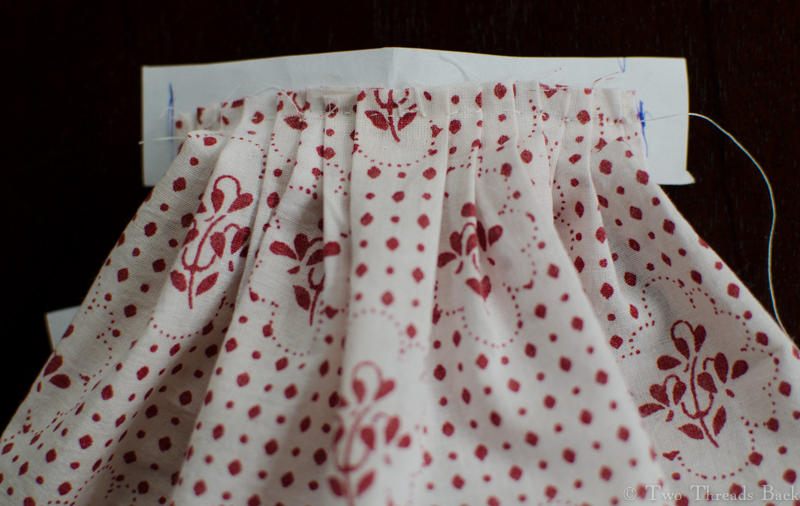 I had to sew the skirt to a paper strip in order to get the pleats even sort of even. At last! 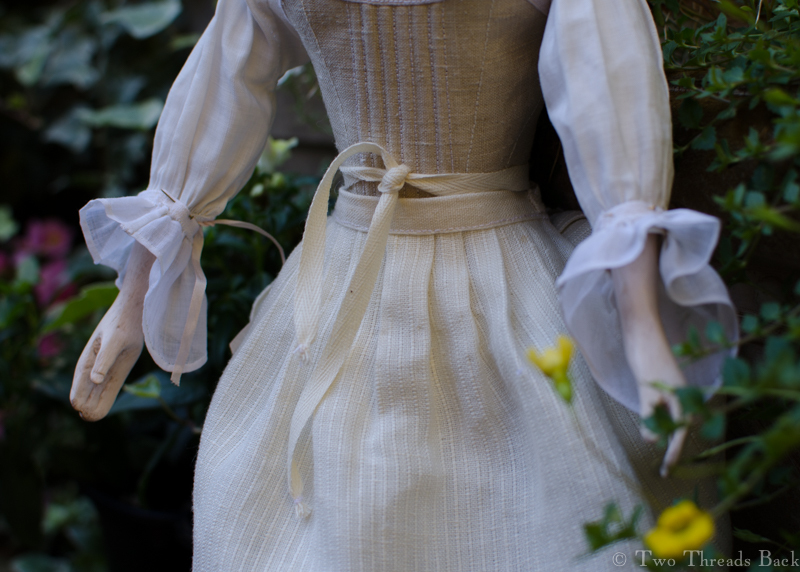 The gown is finished. Or is it? Maybe you’ll notice an alteration in the final photos. 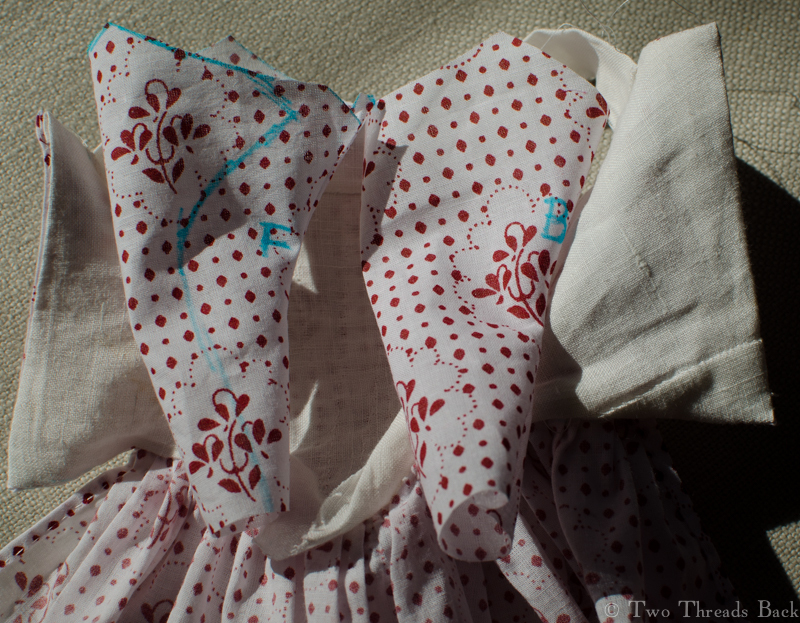 And here’s the petticoat, the only really easy part to sew. 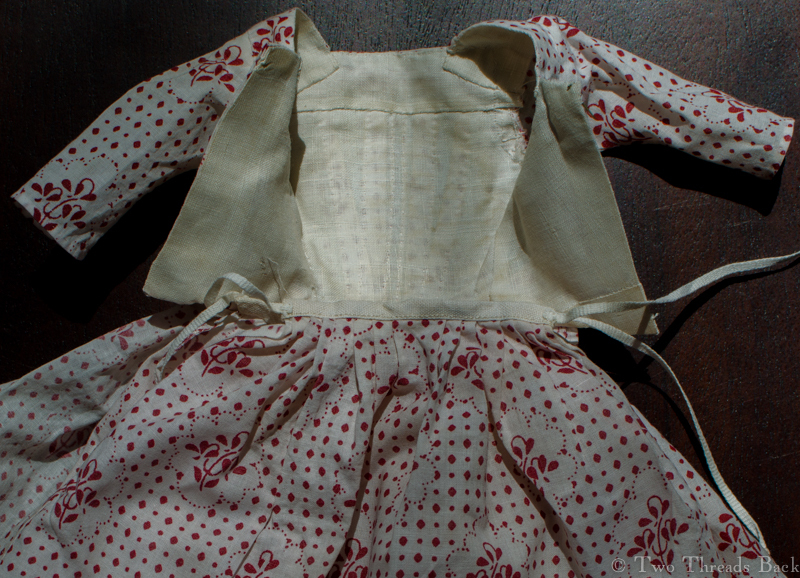 A close-up of the gown folded open, showing the linen lining pieced just like originals could be. Theirs were probably due to a scarcity of fabric. Mine was due to inept fitting. I was complaining earlier about the accumulation of stuff around Pharaby’s middle. 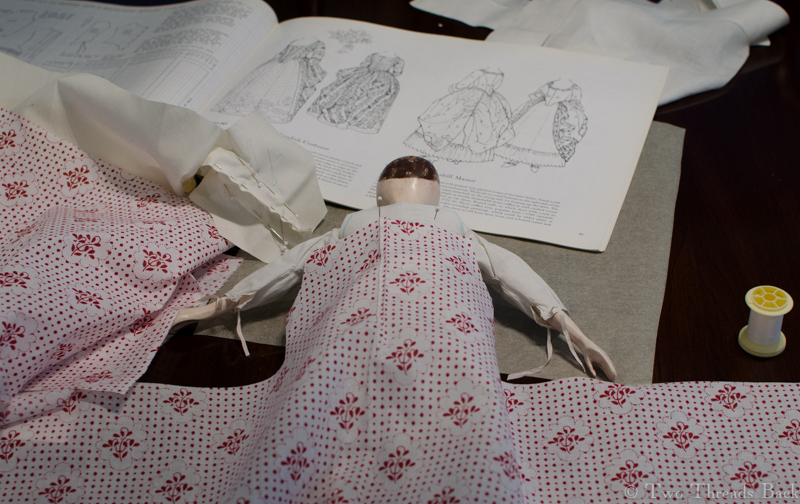 At this point I decided to replace the waistband on her under petticoat to make it more to scale – and reduce her girth. 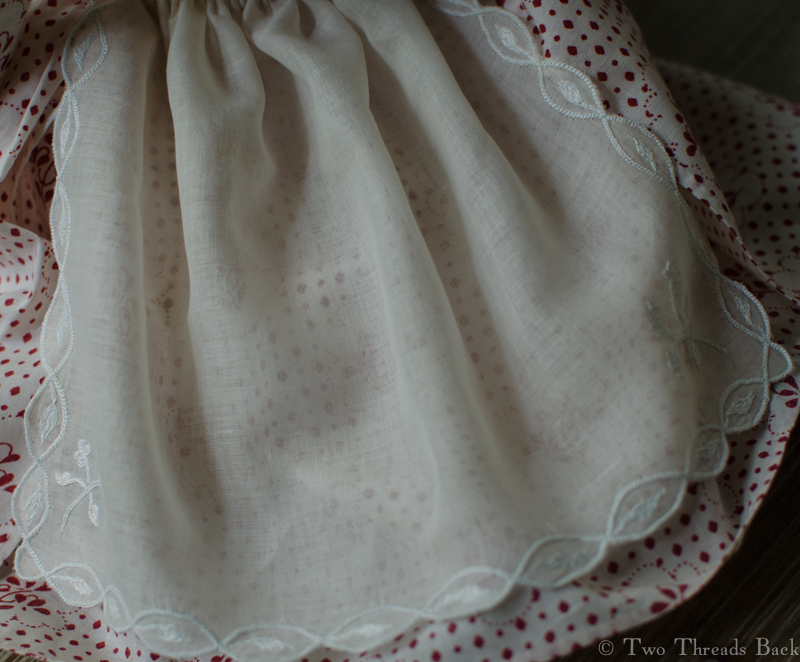 With the gown and petticoat finished, I moved on to her apron. 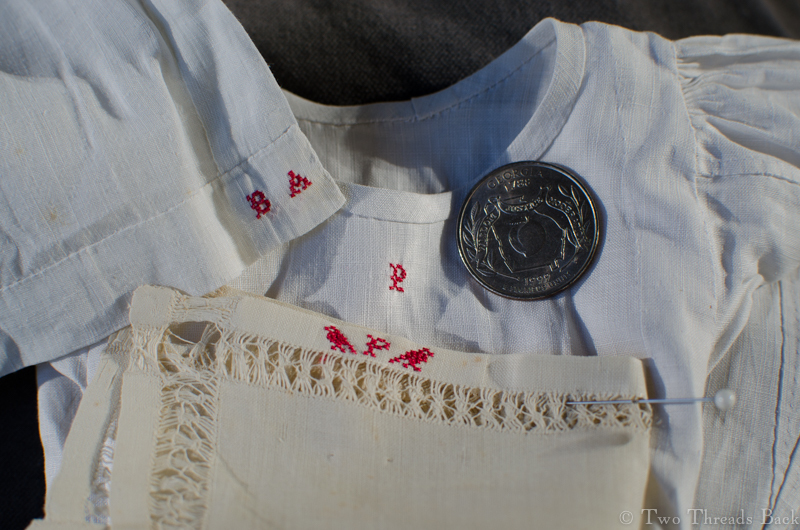 I wanted to use some original 1770s patterns for the embroidery. 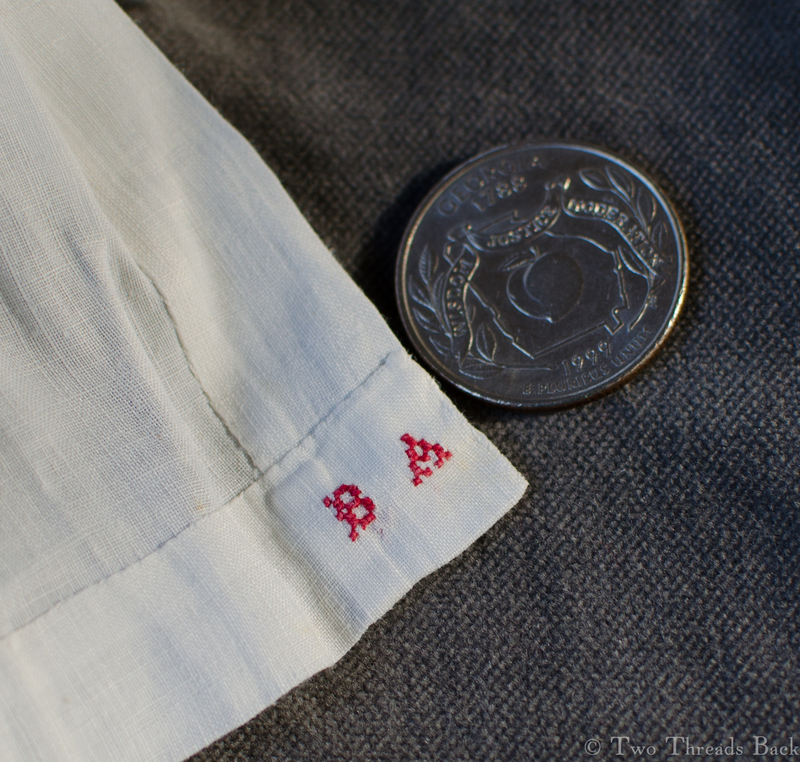 However … with my limited fancywork repertoire, I had to choose REALLY SIMPLE designs that could be done in a couple different stitches. 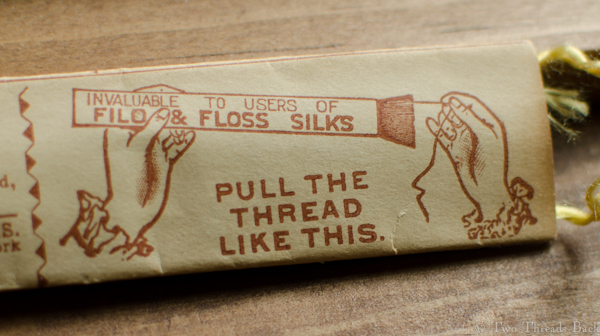 Like chainstitch. 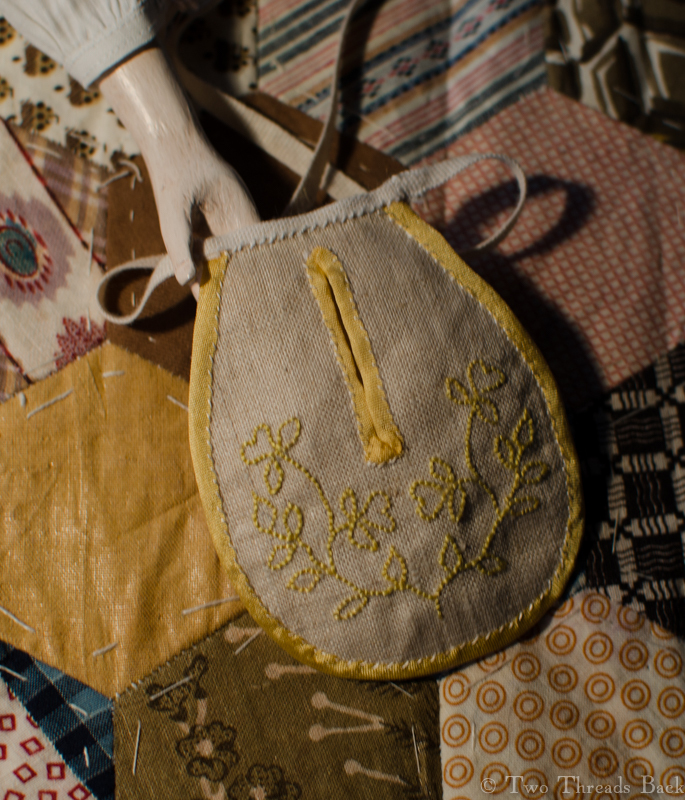 Buttonhole. Running. 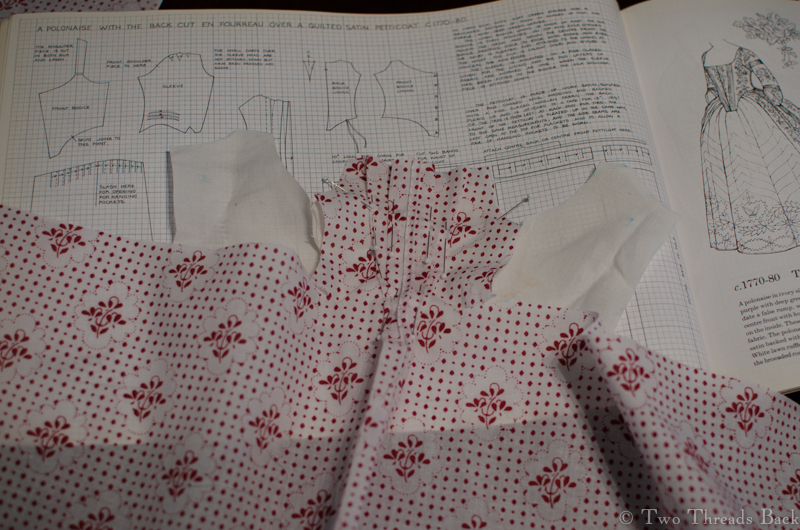 I scanned the original pattern and then scaled it to different sizes to find one that would work. Ok, it’s really still too big, but we settled. 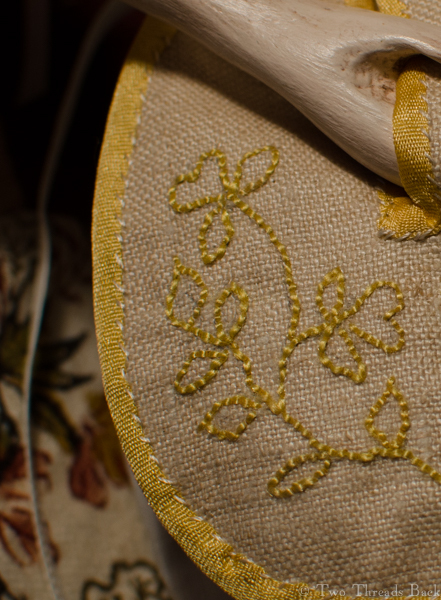 The edges are buttonholed, the leaves are simple running or darning stitches, and the sprigs are chainstitch. The leaves looked horrible when I was working them, but once they were all done it wasn’t quite so bad. 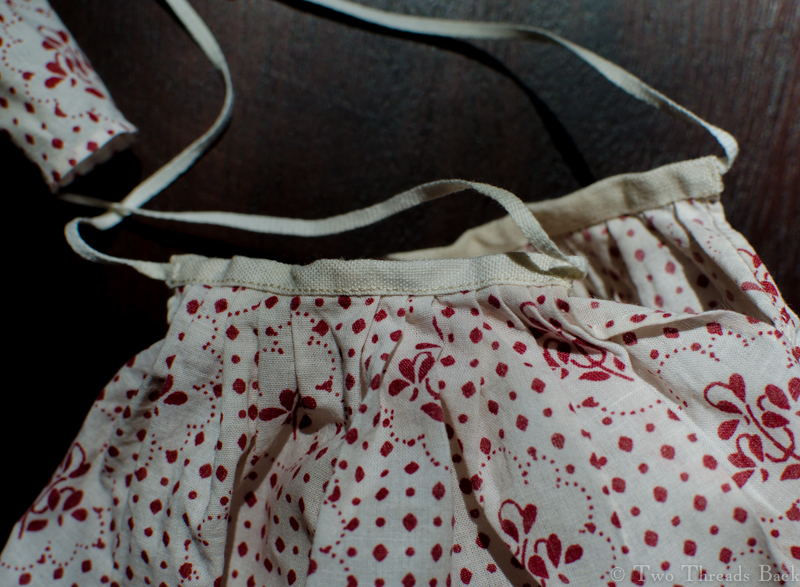 The apron, modeled by Pharaby. 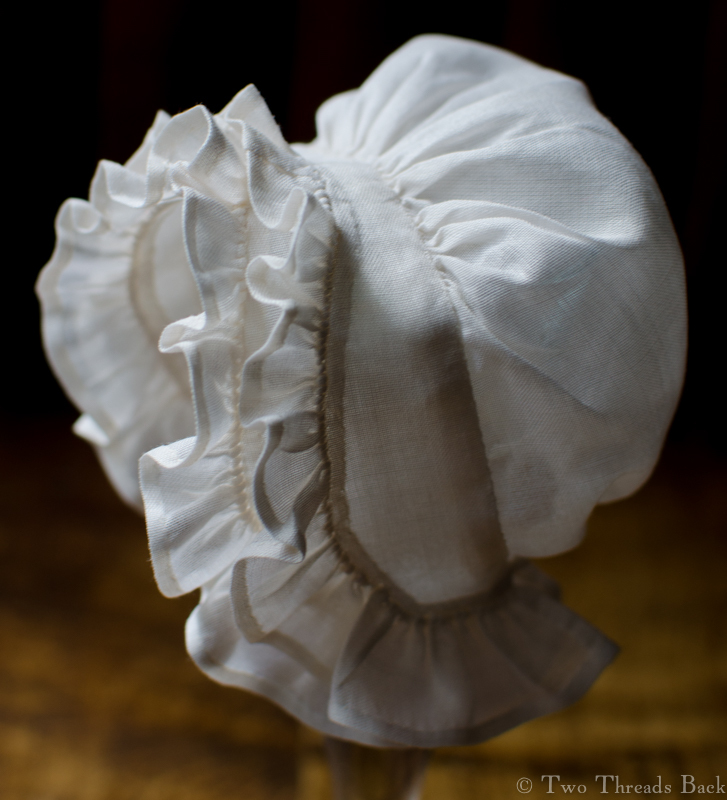 Next came her handkerchief (or fichu, or half-handkerchief). 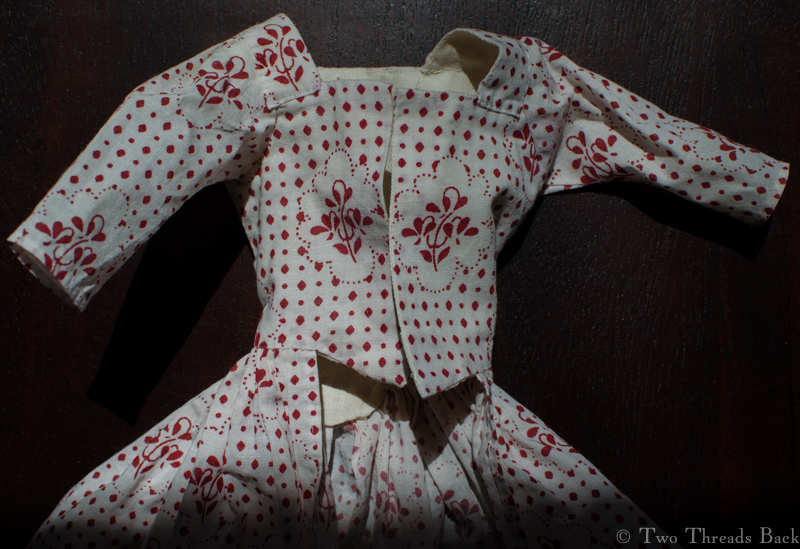 I didn’t do any lace or embroidery on it, since she planned to wear it tucked in. 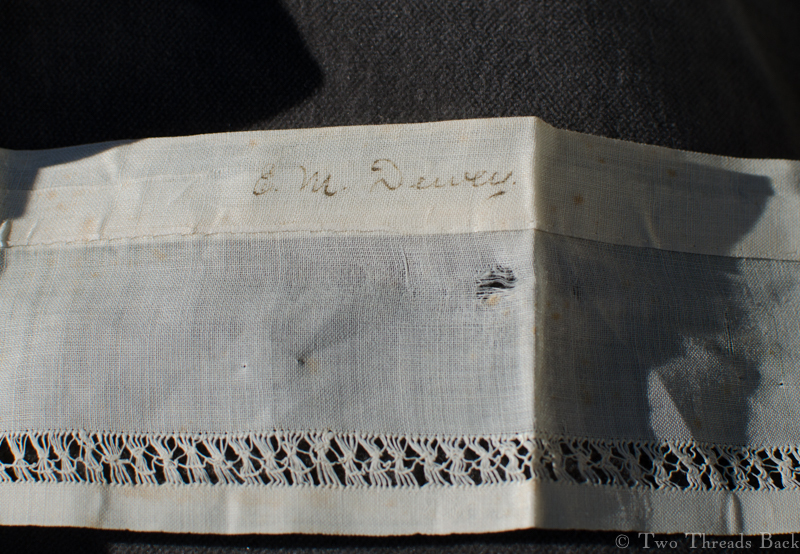 It’s made of the same lovely muslin as her apron. 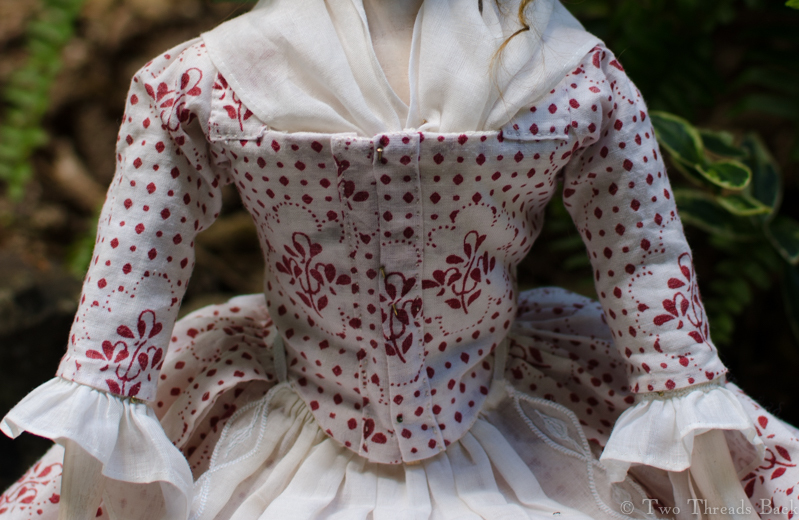 It’s different from her sleeve ruffles, which were salvaged from an antique piece. The older stuff just can’t be matched today, although this came pretty close! 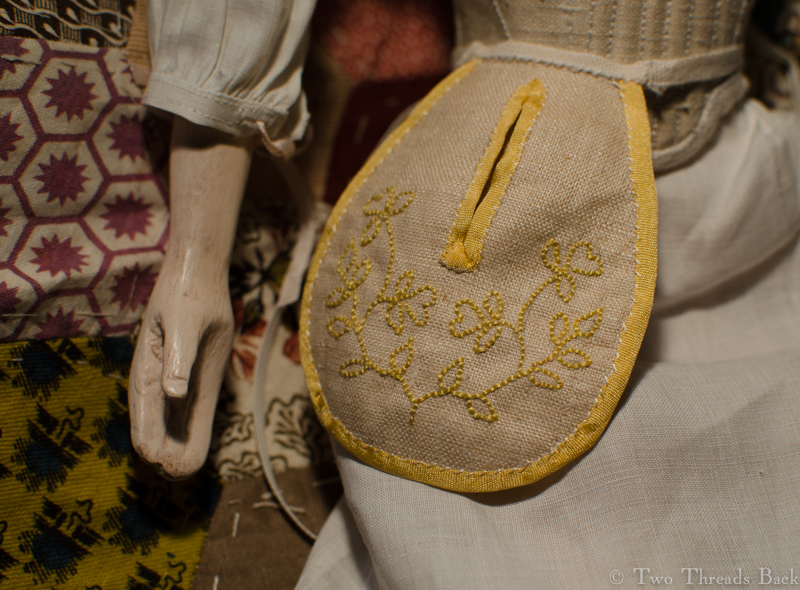 Her fichu, tucked in place; tiny brass pins keep everything secure. From the back, with her hircine wig curls wimping out in our Georgia humidity. 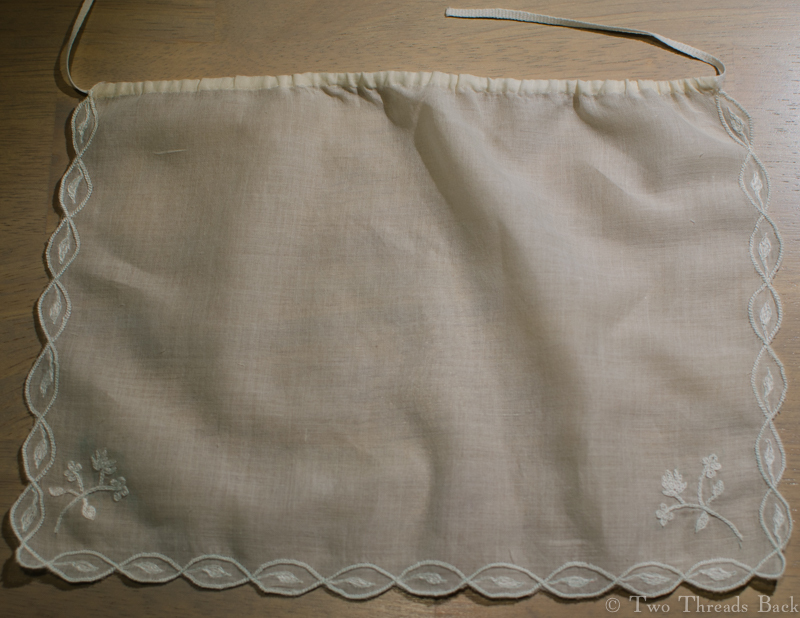 Most of my silk ribbon was for embroidery and too narrow for the cap. So like everyone else in the colonies, we had to wait on the latest imported goods to find just the right ribbon. 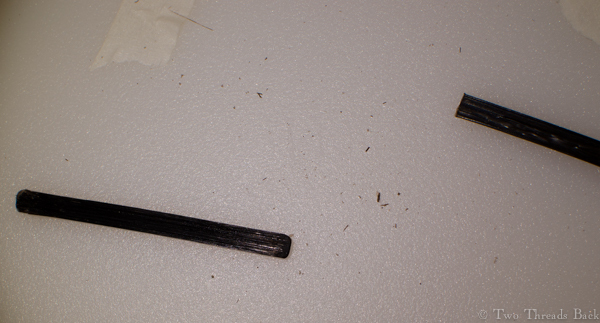 A couple of little thread loops were required to hold the ribbon in place on the back, since I wanted it removable. 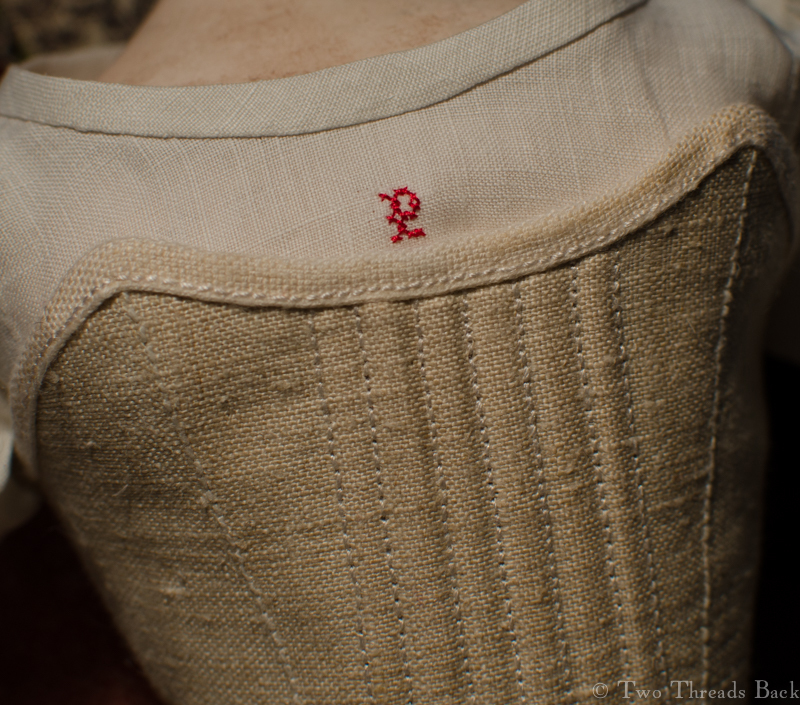 And without having to pick out tacking threads! Last of all were the shoes. I hadn’t a clue how to do them and I’m afraid it shows. This time I didn’t even bother reading or watching tutorials. I just jumped in with both…hands. Pharaby’s poor little feet are only an inch and a half long, and unique. 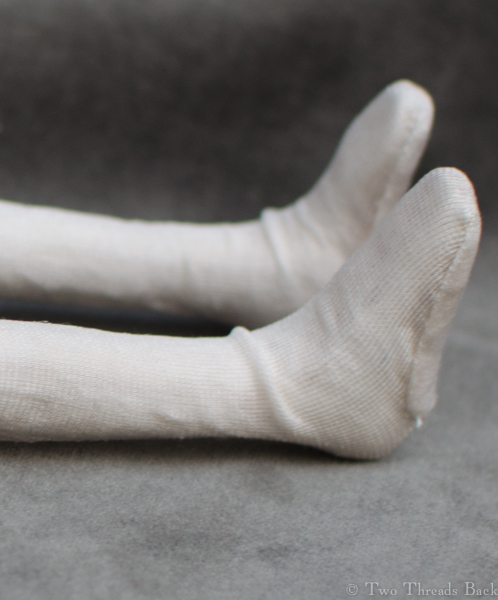 I don’t mean compared to other doll feet, I mean compared to each other. 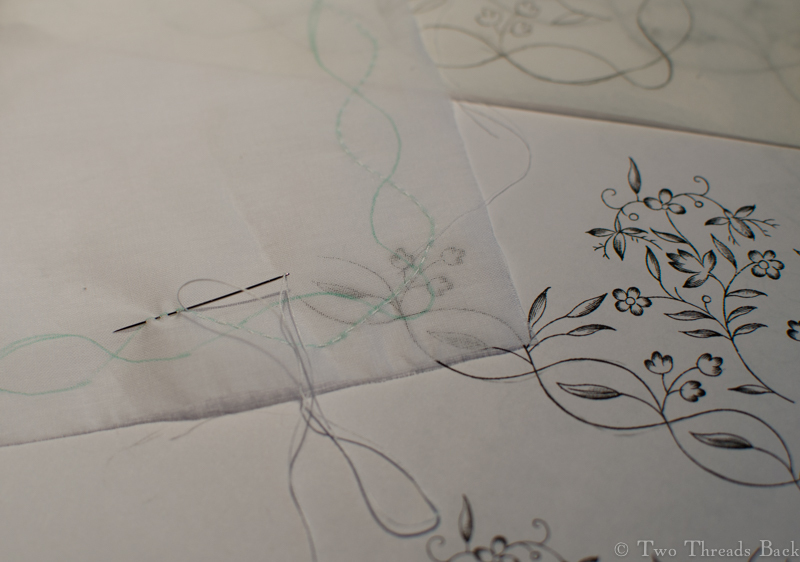 So I made paper ones for patterns, and then used silk scraps and lined them with linen. 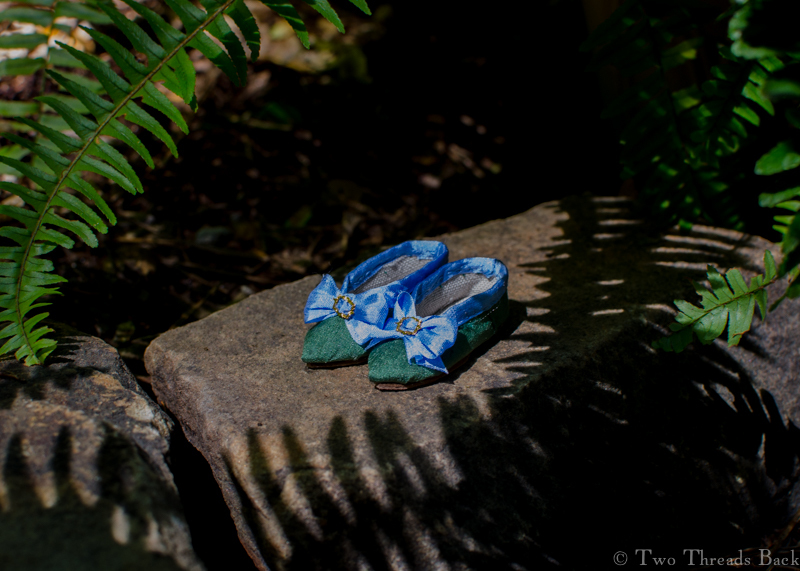 They’re green because that’s what I had, and I happen to adore green shoes. They’re bound with blue ribbon because the only ribbon wide enough was some left from her cap! 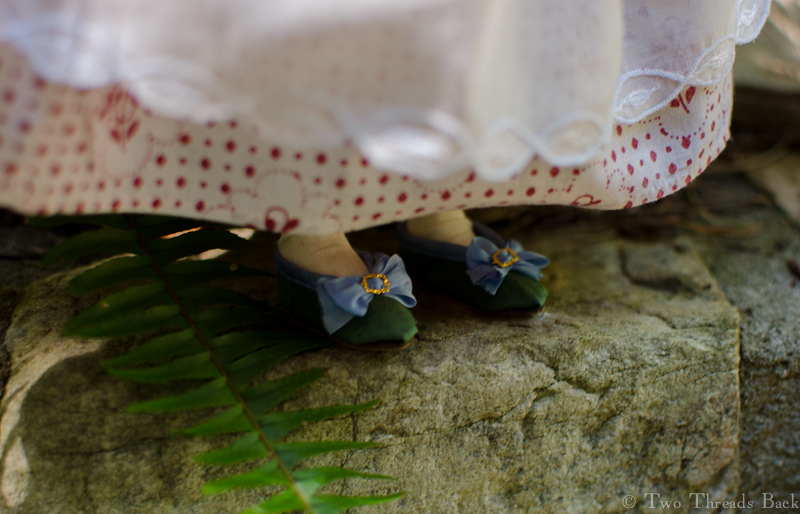 She has Cinderella tendencies. The right shoe occasionally goes its own way when we’re not looking. 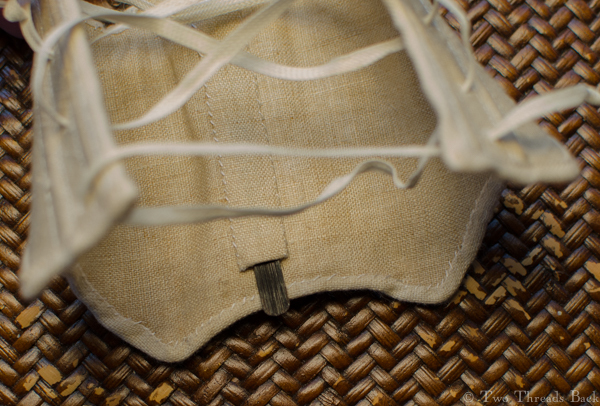 The soles are made from bits off a leather apron. I’m a little embarrassed to show them since they fall so far short of the exquisite slippers I’ve seen done by experts. But everybody needs shoes to relax in and not worry about spoiling. Right? Pharaby practices directing traffic or perhaps gazes blankly at a wall of ivy, so that you may see her from the back. 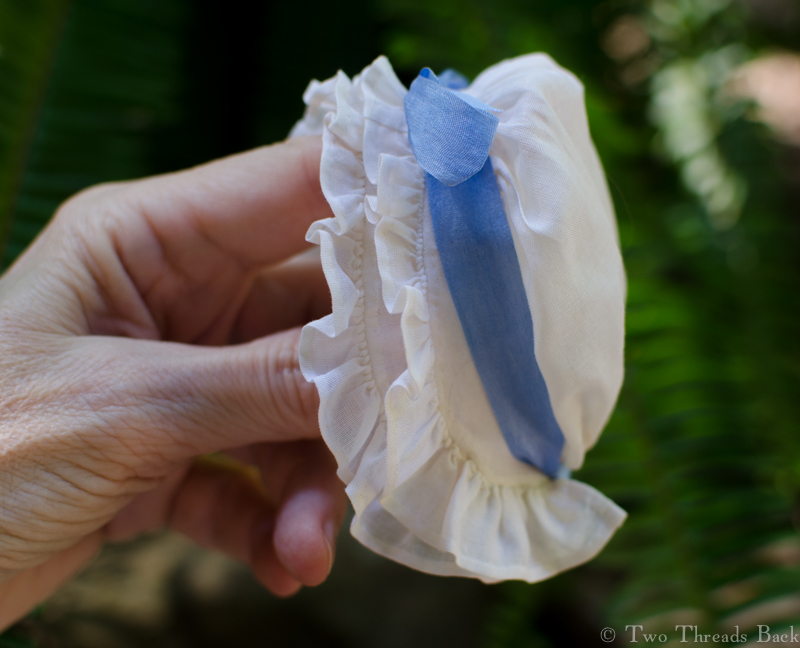 She’s wearing her bum roll for a little poofiness in the petticoats. So Pharaby’s finished, for now anyway. She’s very dear to me, after this long adventure. And she’ll always be a reminder of my father’s love of fun – and love for me. Actually, that should be “Pharaby Sets Her Cap Aside” – for now, anyway. 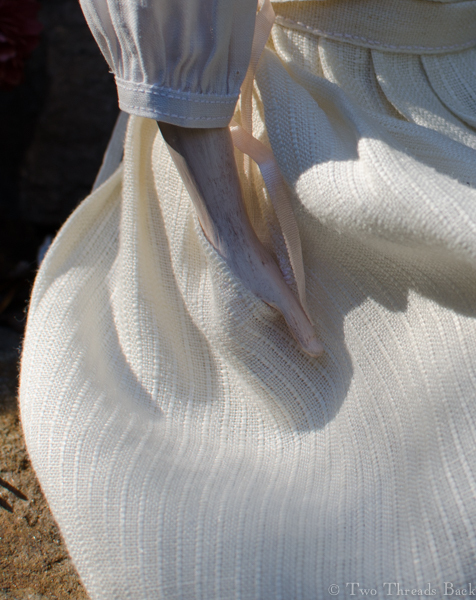 I haven’t completely neglected Pharaby all these months, but sometimes remembering to take photos, and then remembering where I saved them, delay my writing about her wardrobe’s progress. This project also took longer than I thought it would. It was hard figuring out what I wanted her to wear. 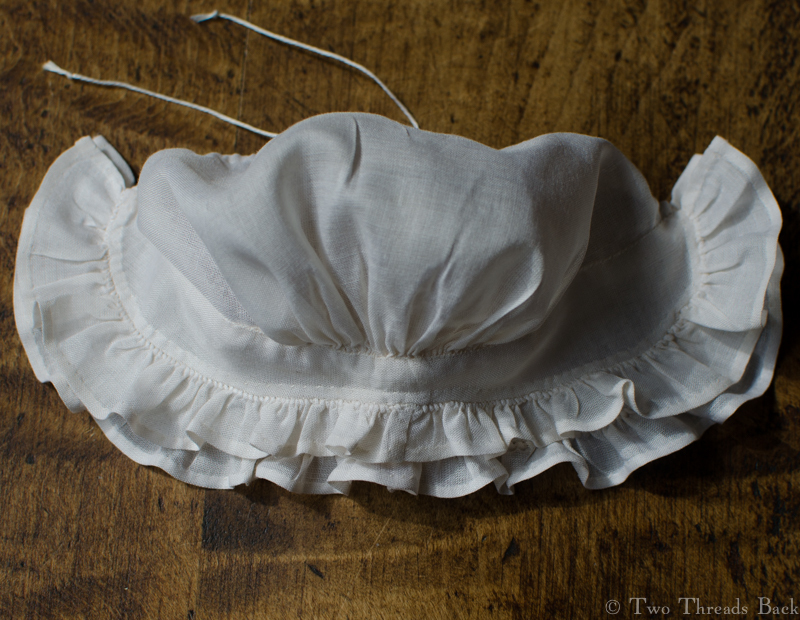 Most surviving Queen Anne dolls just have little bits of lace and silk gathered and stuck atop their heads, or if they’re wearing more constructed caps, the photos don’t show sufficient details for me to copy. 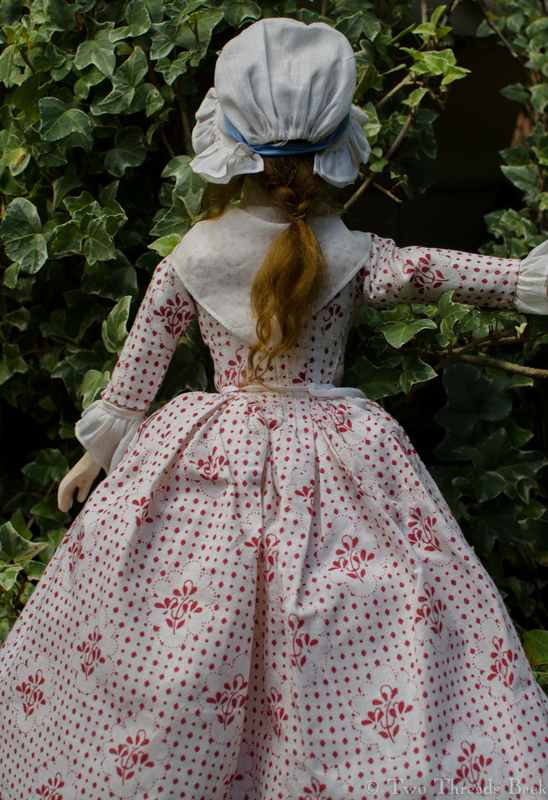 And sometimes the surviving headwear is not original to the doll, being so obviously 19th century that even I can tell! 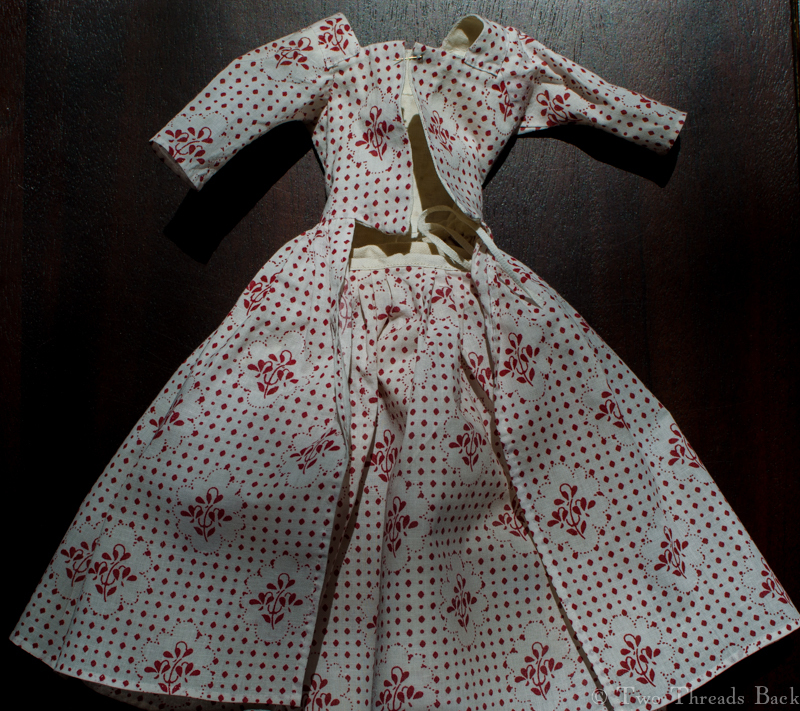 In the end I decided on this style, because it was easy to make a pattern and I’m familiar with the sewing techniques. 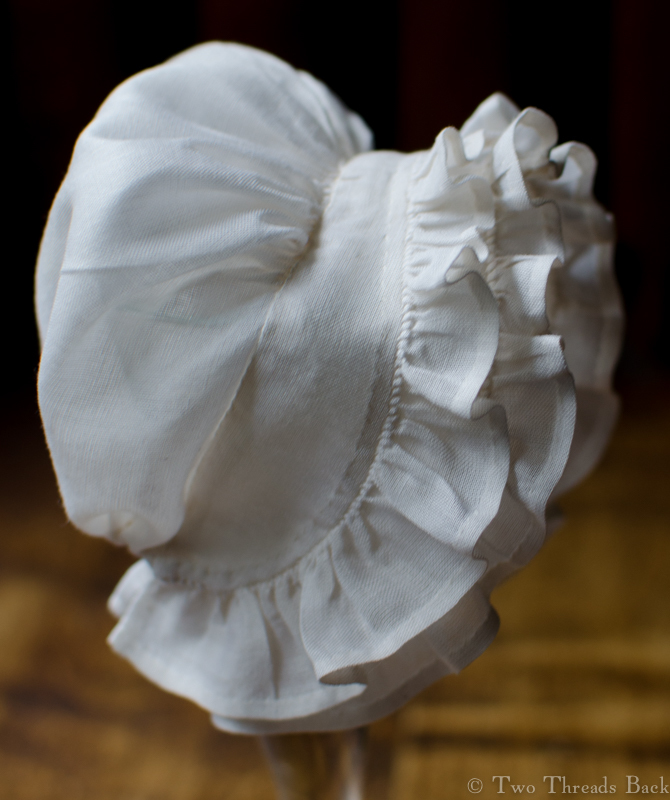 The cap is formed from a simple half circle gathered at the base of the neck and the crown and trimmed with plain frills. 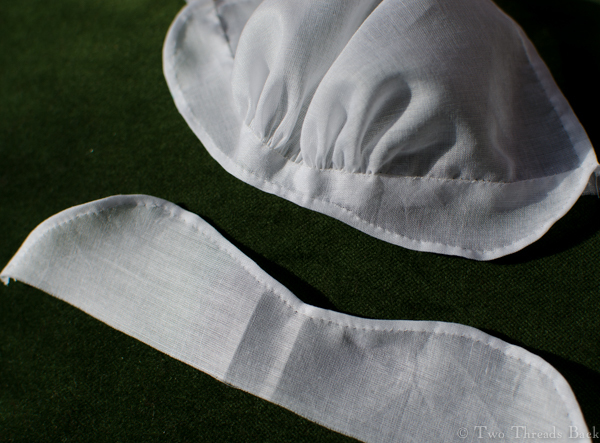 I did experience one of those aha moments when attaching the headpiece/band/brim to the crown. It was easy to “set in” the little gathers on the top thanks to the fact that the band was double. 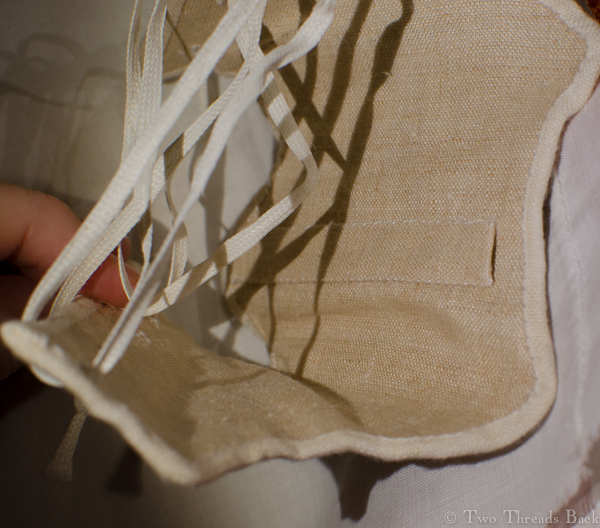 It worked just the same way as setting a gathered sleeve into a cuff! Maybe that’s why they so often had double brims? 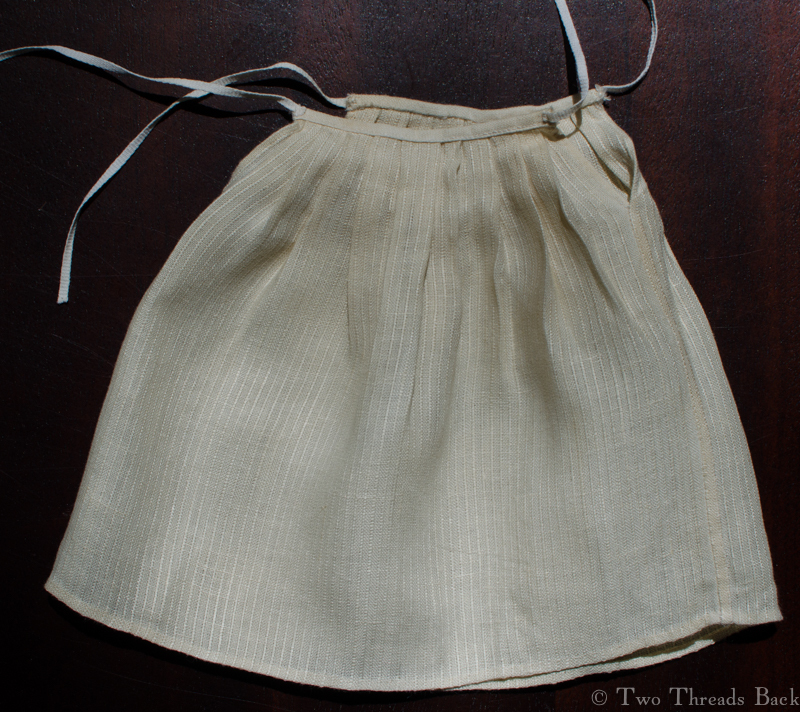 My attempt at narrow hems was a flop, at least compared to what 18th century women could do. 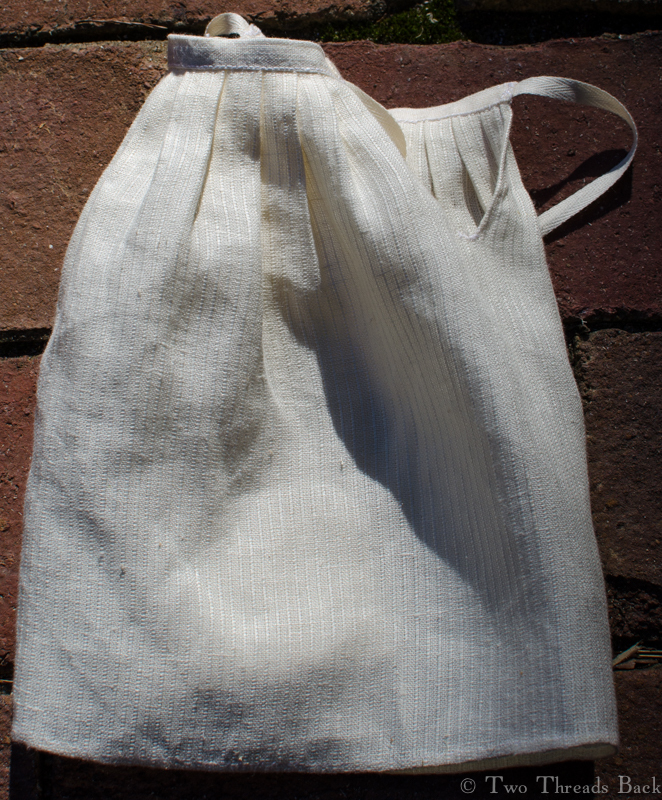 But I did manage a very nice tiny eyelet for the back drawstring. It would have been nicer if I’d also remembered to put in the strings and tack them in place before I hemmed the casing down! 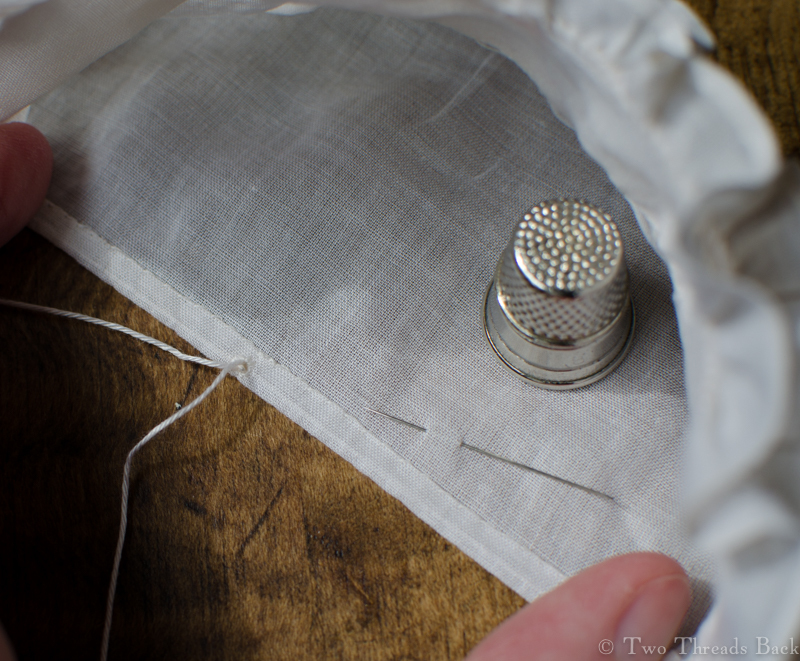 Did you know that you can thread a large needle and retro-fit a string into a casing? Perhaps you’ve noticed none of these pictures show Pharaby wearing the cap? That’s due to my inadequacies as a perruquier. Every time I place something on her wig and then remove it, a few mo-hairs (groan) come loose from the carefully arranged style. In order to keep it all together until her final dressing, I had to limit the try-on’s. Pharaby won’t be modeling her cap for a while, so I let a wineglass serve as a mannequin – and then serve to celebrate one more project done!